It's time for another Finger Painters paint compeition and this month's theme is "Flag Flapper". It would be a flag carrying miniature, an objective or a marker of some kind. 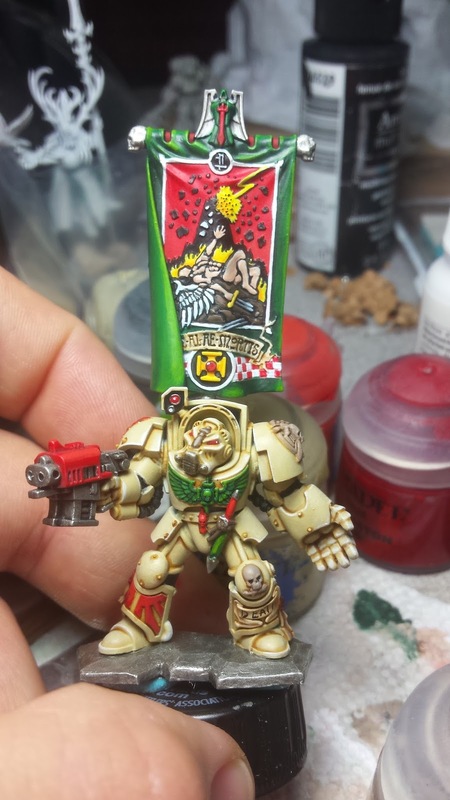 I chose to use the Deathwing Banner Carrier from the Deathwing Command kit. 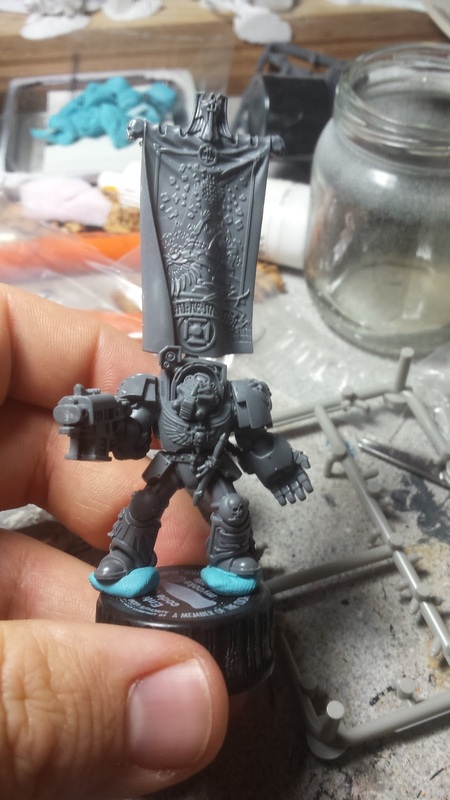 He's been assembled for months, as I picked up a set of these guys and a set of Deathwing Terminators from the Dark Vengeance box set to use with Space Hulk. The big thing, I didn't want to use the 50mm bases that come with them, instead I planned on sculpting my own Space Hulk styled bases to match the Blood Angels and the Genestealers. It turned out to be a daunting task, as I didn't really know what or how to do it. So they sat on the shelf. Since this one was the prototype there were a few things I did that, looking back, need to be done differently. 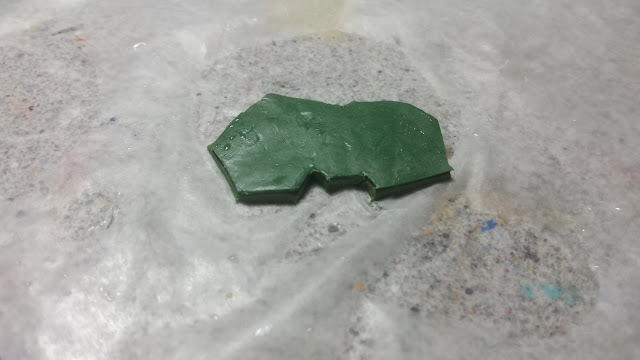 For this one, I attempted to sculpt the shape of the base before hand.I rolled up some green stuff and made the shape I needed out of a thin layer of it. Then the following day I rolled out a thicker batch and laid the original on top of it, then once dry I cut away the excess. Instead I think what needs to be done is to roll out a "sheet" for green stuff and then cut the bases out of it. It looks pretty solid for my first attempt and it seems to fit the style nicely. With the base done, it was time to get painting. For this guy, I decided to try something different. Usually, I paint a shadow, then a midtone and then the highlight. But these guys are a white/bone color. 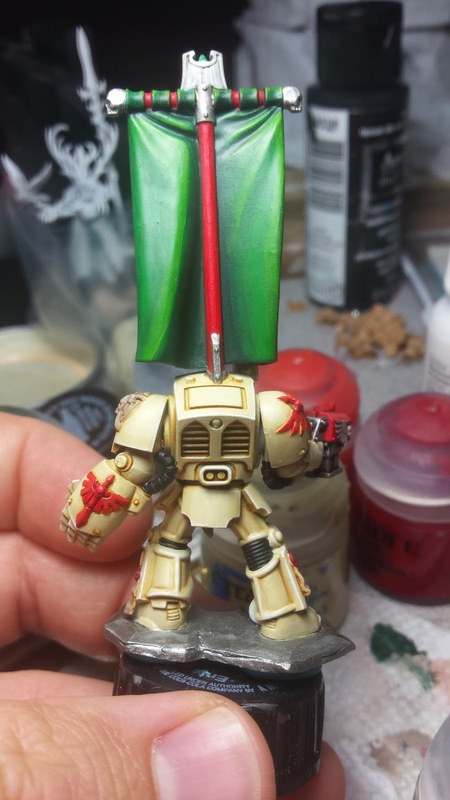 Instead, I decided to paint the midtone first, followed by a wash of Seraphim Sepia in the recesses, a highlight of Screaming Skull and an edge highlight of White. I followed a similar process on the reds, because I wanted a nice bright red, rather than the dark red I normally go for. So I started witha base color of Evil Sunz Scarlet with a simple highlight of Wild Rider Red and no edge highlight. The banner was fun to paint too. I usually hate painting large sections of cloth, like banners or cloaks.But for this one I attempted to blend the different shades using the two tones at once, mixing them wet on the miniature itself. 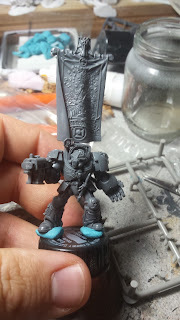 First I painted the entire thing Caliban Green. 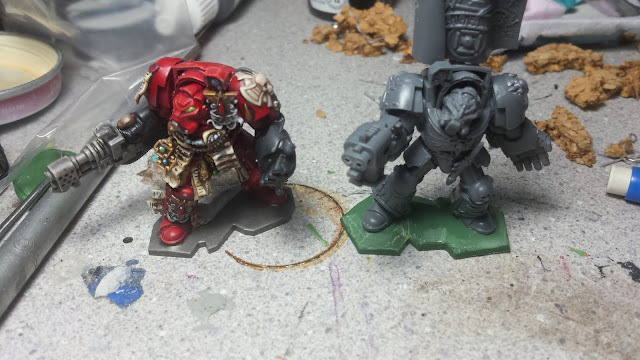 Then I plucked out the highlighted areas with Warpstone Glow, once that was dry, I covered the edge of the lighter green with Caliban again and with a wet brush and slightly thinner Warpstone, I worked it over the still wet Caliban. The results turned out well and I repeated the process with Moot Green and Warpstone Glow, as needed. This guy turned out really well, and I'm super happy with him. The comp deadline isn't until Sept 30th. But I'll update this afterwards with the results.